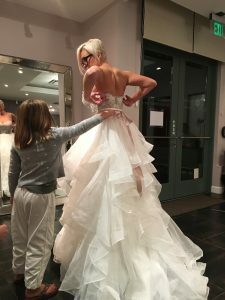 I have found most brides are extremely creative and think outside the box, they just don’t have the technical skills to apply that ability, but a good tailor does! 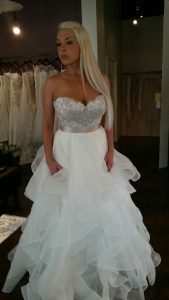 Sometimes it is just not possible to walk into the bridal boutique and find the dress of your dreams. Don’t let that discourage you, because if you can visualize, a good tailor can materialize…you need only find a technician who can interpret your vision accurately and execute it with precision. This is a two-piece dress with a beaded corset top and an organza skirt with vertical ruffles, edged with horsehair braid to give the edges ‘bounce’. 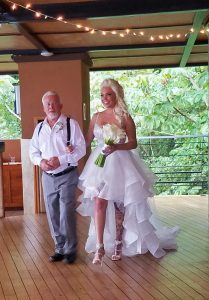 Our bride has beautiful legs she wanted to show, which are lost in a full skirt such as this. She was very committed to the vision she had of herself in a high-low wedding gown, so we set about creating something a bit less conventional than the typical offerings of bridal boutiques. The corset was a sample piece, and therefore couldn’t be ordered in her size, but some crafty alterations lowering the back, defining the cup and bust area, and adding straps proved very successful. The skirt was her major concern, because the end look would be drastic compared to where we started, and perhaps difficult to envision, unless you happen to be a designer. Our Bride is gifted with a keen eye and great communication skills, so it wasn’t difficult to realize her dream for her. Plus, working with her was delightful and inspiring!